Located in the north end of the city, the Stadium is probably the best preserved and biggest of its type in Mediterranean. It is 262 m long and 59 m wide with 22 rows of seats. It has the capacity of 30.000 spectators. The ends of the stadium are slightly convex, giving the whole a form rather suggesting an ellipse. In this way, the spectators seated in this part of the stadium would not block each other's view and would be able to see the whole of the arena. 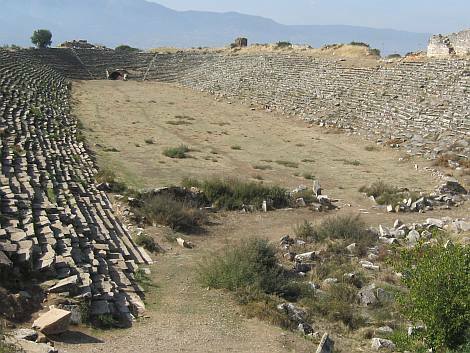 The stadium was specially designed for athletic contests, but after the theatre was damaged in the 7th century earthquake the eastern end of the arena began to be used for games, circuses, wild beast shows and gladiatorial combats. During the Roman period the stadium was the scene of a large number of athletic competitions and festivals.